Additionally, within the Ark of the Covenant, Moses was to put some of the manna that God gave to the Israelites. The manna is often described in the Old Testament as the “bread of angels,” and was a heavenly bread that the people of Israel ate in the desert (Psalm 78:25). Both the manna and the Bread of the Presence (a sacrificial offering of bread that was eaten by the priests, along with wine) have distinct parallels to the Eucharist that Catholics consume, and are seen as prefigurements of it. When celebrating the Mass, the early Christians knew that they could not simply dispose of the left-over Eucharistic bread and at first, because they were being persecuted and did not have churches, they distributed all the remaining hosts to be carried to the sick and homebound. When the persecution ended Christians started to build churches and, at the same time, tabernacles to house the reserved Blessed Sacrament. The first tabernacles were often shaped like a golden dove within a tower suspended over the altar. It wasn’t until the 17th century that more specific guidelines were laid down and tabernacles began to resemble those that we see in our churches today. The Catechism further explains the history of the tabernacle and how “the tabernacle was first intended for the reservation of the Eucharist in a worthy place so that it could be brought to the sick and those absent outside of Mass. As faith in the real presence of Christ in his Eucharist deepened, the Church became conscious of the meaning of silent adoration of the Lord present under the Eucharistic species. It is for this reason that the tabernacle should be located in an especially worthy place in the church and should be constructed in such a way that it emphasizes and manifests the truth of the real presence of Christ in the Blessed Sacrament.” (1379). As mentioned above, the use of a tabernacle in Catholic churches rests solely on the doctrine of the Real Presence of Christ in the Eucharist, the knowledge that Jesus himself is truly present under the appearances of bread (and wine). In other words, the tabernacle is not used in a symbolic way, to symbolize God’s presence among us, but in a real way (like the Tabernacle of the Old Testament) to house and protect the real presence of God in the Eucharist. This is also why Catholics genuflect when passing the tabernacle. We do so in honor of the real presence of Christ present in the Eucharistic bread reserved and protected in the tabernacle. The vigil lamp burns as a sign of Christ present. On Holy Thursday night, after the Mass of the Lord’s Supper, the Blessed Sacrament is removed from the main tabernacle to an altar of repose elsewhere in the church, for a time of adoration. 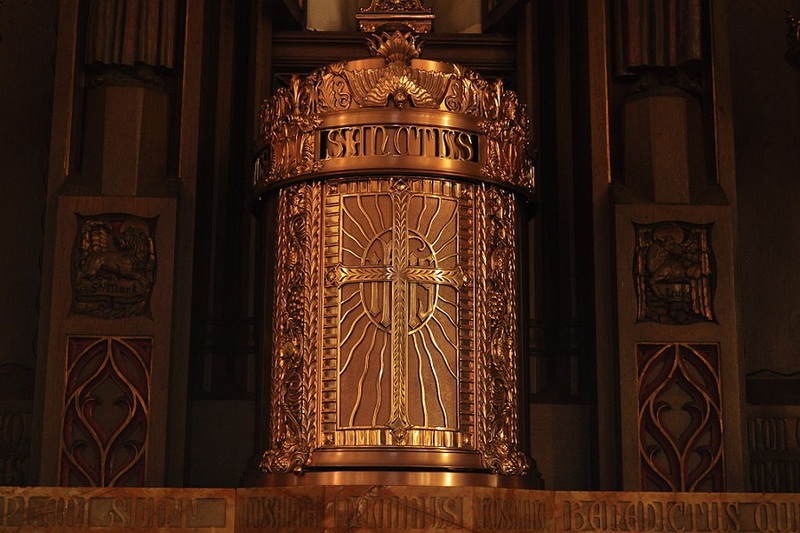 For the period from Holy Thursday night through the beginning of the Easter Vigil on Holy Saturday night, a time when we recall Jesus’ death and burial, the tabernacle is empty, with the door left open and the vigil lamp extinguished. Without the Eucharist, the tabernacle is simply an empty gold box.